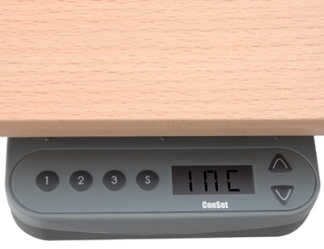 Conset height-adjustable desks come with a standard 2-button controller. To adjust the height you press and hold the left button. While holding the left button you toggle the right button either up or down, depending on the direction you wish the desk to travel. This switch is not programmable. If you require a programmable switch, there is the Conset Programmable Switch accessory which allows for 3 heights to be programmed into the switch. This accessory is model 139250 and retails for $67.50. This controller is compatible with the following models: 501-15, 501-27, 501-29, 501-49. The Triple Nested Column design ensures stability throughout the 26" range of adjustment. The height adjusts from 21" to 47" at a rate of 1.2" per second, with a lift capacity of 220 lb. An Anti-Squeeze Protection System will automatically engage if the resistance increases noticeably while moving down. This base will support a wide variety of stock work surfaces (minimum width 62" and maximum depth 36"), and will also work with any custom top up to 36" x 62". It will even accommodate tops as shallow as 18". 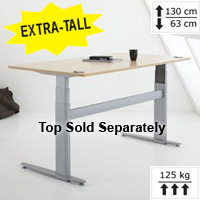 The 2-Leg model is suitable for most standard tables, and comes in a 32 7/8" wide and 59 13/16" wide model. Note: Prices refer to in-stock items only. Sample images and information sheets. The 501-29 Series from Conset is designed to accommodate taller individuals who require a greater range of adjustment for sit-stand applications. The height adjusts from 24.8125" to 51.1875" at a rate of 1.2" per second, with a lift capacity of 276 lb. An Anti-Squeeze Protection System will automatically engage if the resistance increases noticeably while moving down. A full-width Cable Tray for superior cable management is also included. There are four models based onwidth and they will support a wide variety of stock work surfaces, and will also work with most custom tops. The entire base is powder coated in a silver color. The 501-11 Series from Conset is a heavy duty workhorse which features a Bosch motor to provide ultimate reliability. The height adjusts from 24.8125" to 47.25" at a rate of 1.1" per second, with a lift capacity of 330 lb. A modesty panel is included, in addition to a full-width cable tray for cable management. 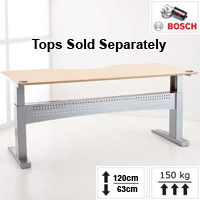 The unit is 77.37" wide and will support a wide variety of stock work surfaces. 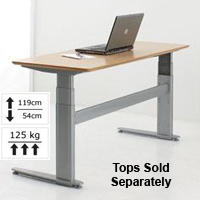 Conset's 501-32 Series of electric desk bases are a cost effective frame with excellent value. Designed to work well in limited space applications, the 501-32 series bases will accommodate tops as shallow as 18" and are ideal for many of today's 24" deep desks. 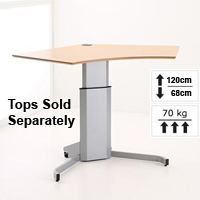 This base will work well with a wide range of tops and the removable top bracket permits the attachment of keyboard supports. 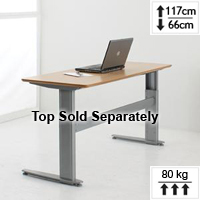 The dual nested column design ensures a stable desk while a range of frame elevation from 26" to 45.6875" make this frame a versatile choice for most users. At 176 lbs. it has a lower lifting capacity than some of the other Conset frames. The 501-49 Base with a tubular leg design enables the removal of the usual lower traverse crossbar without any sacrifice in the stability of the frame. The result is a clean, contemporary, open design with nothing to interfere with leg movement. Black or silver frame colours are completed with chromed steel telescoping inner legs for a distinctive look. An expanding upper bracket permits 4" incremental width changes from a minimum of 45.6125" to a maximum width of 69.25", making the 501-49 the most versatile desk frame that Conset has offered to date. For those seeking a quieter unit, the 501-49 is substantially quieter than most other current Conset bases (i.e. 501-27, etc.). The new design also yields an increased upper range - permitting the frame to elevate from 24.75" to 48.375" at a rate of up to 1.26"/second. The lower range is slightly higher than other frames but at 24.75". Ideally suited for most tabletops, the 20" deep upper bracket supports make the 501-49 ideal for most desktops and lifting up to 176 lbs. It will not, however, work with tops shallower than a nominal 21" depth. 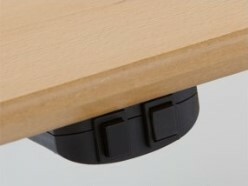 The 501-15 Series is an economical, width-adjustable option for the base of an electric workstation. The Extender Rod (Drive Shaft) connecting the two legs can telescope from 40.9" (104 cm) to 70.8" (180 cm), allowing this base to accommodate a wide range of tabletops. 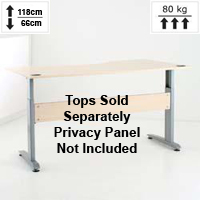 Unlike all other Conset bases, no modesty panel is included due to the unique telescoping width capability. 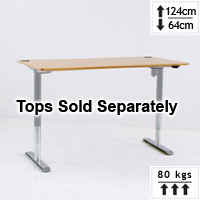 This base will support a wide variety of stock work surfaces and most custom tops. The entire base is powder coated in an attractive silver color. Note: This unit requires a user-supplied cross brace correctly cut and installed prior to operating the unit. If only the tabletop is affixed without a cross brace then the base is not safe or stable.